This is a fun item. Yes. 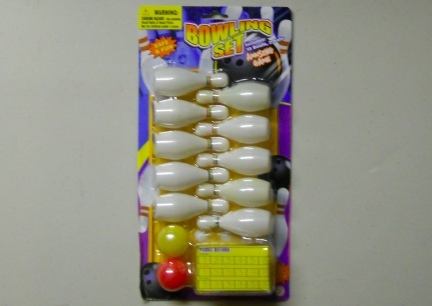 You sure can teach your Guinea Pig to push the little bowling ball and knock over these light weight bowling pins. While not competition equipment, will be a lot fun and is functional and great for training and having a great time at home or with friends that also own small animals. It is also highly recommended for entertaining friends and family with your small pets antics!! 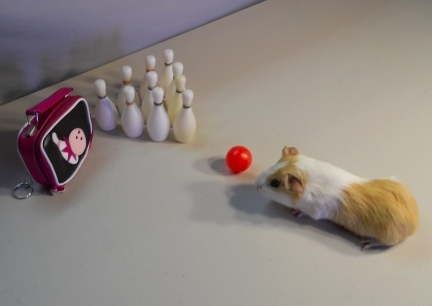 See ideas on how to train your small pet to bowl on our trick pages at this and sister sites. PLEASE NOTE: Our animals have not been around this bowling set....our animals have their own bowling sets. YOU ONLY PAY SHIPPING ON ONE ITEM PER ORDER WHEN YOU SHOP WITH US. THAT IS RIGHT, YOU ONLY PAY SHIPPING ON THE HEAVIEST ITEM PER ORDER, SO PLEASE KEEP SHOPPING! This smaller item has a smaller shipping charge of $2.95 to the USA when shipped with similar items. Your shopping cart will show your shipping costs and total based on the items in it.